I’ve gotten inspiration for my Manicure Monday tutorials from my favorite clothes, from holidays, and even from just staring at my nail polish collection. But I also get my inspiration from one of the most inspiring places of all – Pinterest! If you can browse Pinterest without getting inspired, you’re pretty tough. I browse Pinterest and I suddenly think I’m Martha Stewart, Rachel Zoe, and Jillian Michaels all rolled into one. I’m definitely not, but it does make you feel good to be inspired! I saw this manicure on Pinterest and thought to myself “I can do that.” So I did! Read on to see how I got the look. Spoiler alert: it’s easier than it looks! Start out, as usual, with clean nails and your favorite base coat (Nail Tek II is awesome). Next, apply two coats of a gold polish. I love Color Club’s Disco Nap. It’s the perfect opaque glitter – the glitter is so fine that it’s almost indistinguishable from the polish. It’s more of a hyper-shimmer than a glitter, to be honest. But if you’re looking for a good, opaque glitter, go for Color Club. Before moving on, make sure that your manicure is completely dry. You’ll be using a nail art pen to create the design, which puts pressure on your nails and will mess up your base color if it’s not dry. So be patient! Watch an episode of the Real Housewives like I did. To create the cross-hatch design, I used Sally Hansen’s Nail Art Pen in White. Begin at the top of your nail, by the cuticle, and create 3-4 white diagonal lines across your nail. Then switch and begin drawing 3-4 diagonals the opposite way down your nail. Continue this pattern until you cover your nail. I avoided using a topcoat because I didn’t want to smudge the design – but I woke up the next morning and my lines actually wiped off onto my sheets. So watch another episode of RHOC while your design dries and finish your beautiful new manicure with your favorite topcoat! Let us know if you try this look! 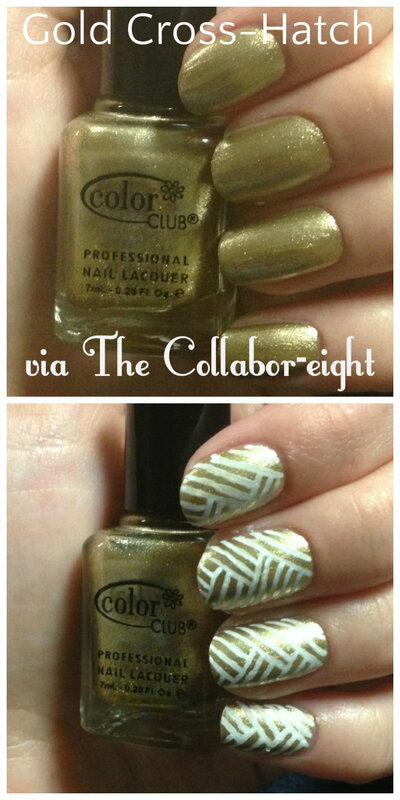 Share your #manicuremonday pictures with us on Facebook or Twitter @Collaboreight.